Running on treadmills can keep you fit no matter what time of year it is. You can get your run in and stay comfortable indoors. And you don’t have to bundle up. Treadmill running is also much safer considering the number of pedestrian accidents that can occur. They’re used in training by Olympians and everyday athletes. But all of that running can do some damage to your body in the long term if you don’t have proper shoes. Keep reading to find out more about treadmill running and finding the perfect shoes for treadmills. There are countless benefits to treadmill running. But while you think that running on treadmills and running outdoors are the same, think again. There are two main differences between the two. The first is that you use different muscles when you’re training on a treadmill versus running outside. On a treadmill, you use your quadriceps more than your hamstrings. That’s because you use your quadriceps to push off of the treadmill. Not only that, but you use your hamstrings less on a treadmill because the belt helps you lift your leg behind you to complete your stride. When running outdoors, that job would normally be done by your hamstrings. The second is the ground difference. On a treadmill, your body will be used to an even and consistent stride. Running outdoors forces you to pay attention because there may be uneven sidewalks, tree stumps, or curbs. Your body will adapt either way. That’s why it important to have the right shoes for treadmills and to vary your treadmill workouts. Since running on treadmills is different than running outdoors, there are a few things to consider before buying a pair of shoes. The first is cushioning. 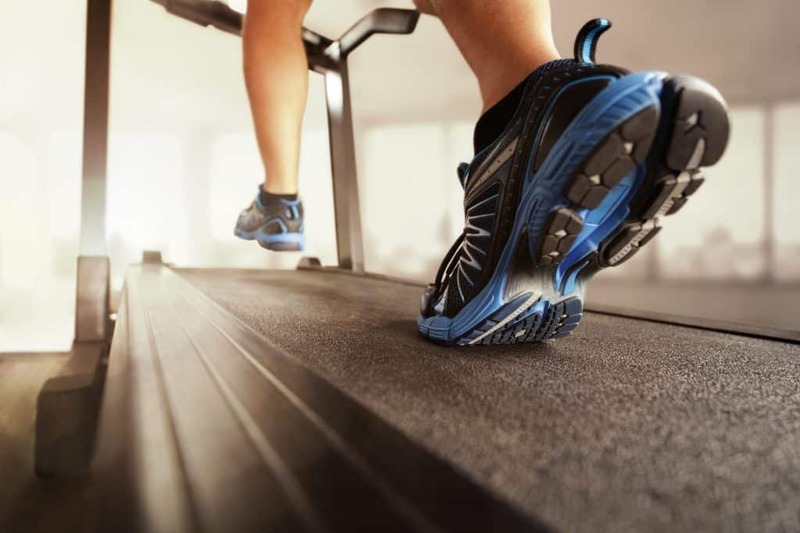 Running on a treadmill has more cushioning than an outdoor surface, so you may want to consider getting shoes that have less cushioning. Also, keep in mind that with the treadmill, the balls of your feet will absorb a fair amount of shock. You want to have shoes that are flexible in the balls of your feet. Your shoes should not bend in the arch of your feet. To pick shoes that best fit your running style and body, you have to be aware of what they are. For example, your feet may overpronate, or roll inward. Your feet may be neutral. Your running style may be to push off, which puts pressure on the outside of your feet. The best thing to do is to get a running analysis done at your local running shop. That will tell you how your body moves so you can get shoes to best support you. If that’s not an option, check the soles of your current pair of shoes and see how the soles of the shoes are worn. If the outside of the shoe shows the most wear, this means that your feet underpronate and your shoes will need more cushioning. Shoes that show wear in a pattern shaped like an S mean that your feet are neutral and most shoes will work for you. Finally, if the soles are worn on the inside of the heel and around your big toe, you tend to overpronate. You should look for structured shoes. Once you know what to look for in shoes for treadmills, you can easily find the best running shoes for you. These are great for men and women and have top arch supports for overpronation. The arch of the shoe is filled with SpevaFoam, and DuoMax support to provide stability and comfort. This is another shoe to consider if your feet overpronate. This shoe is fantastic for treadmills because of its simple and lightweight design. Not only o you have extra support in the arch, but you have support in the heel. There’s a hard piece of plastic that wraps around the heel to provide extra support. This shoe was built to last. It’s a great shoe for neutral feet and underpronation. If you plan on going on long runs on the treadmill, you should take a look at this shoe. You might find the shoe to be very stiff at first, with little flexibility during the first few runs. These shoes will become more flexible after a few uses, making the shoes very comfortable. Mizuno’s Wave Creation shoes have been around for quite a while. These have long been a popular choice for neutral and underpronated feet. These shoes are also built for high-mileage wear. They’re supportive, comfortable and stable shoes. On the downside, these shoes do run a little narrow, which can cause blisters if you have wide feet. Nike’s Lunar Glide 9 shoes are soft and lightweight, coming in at under 10oz (281g). They’re built for overpronated feet. The laser-cut grooves on the bottom of the shoe make it ideal for gripping the treadmill as you run. The main thing to remember when it comes to running shoes is comfort. That doesn’t mean choosing the best feeling shoe in the store. It means choosing a shoe that will keep you comfortable during your entire run. A study in the British Journal of Sports Medicine showed that runners have a natural “comfort filter” that allowed them to choose the shoes that move the best with their body during a run. When you’re buying shoes, try them on and see how your comfort filter kicks in. Now that you know the best shoes for treadmill running, are you ready to start training? You can start with a treadmill at the gym or have the privacy and convenience of having a treadmill at home. Simply Fitness Equipment exists to help you wade through the massive amount of information and fitness products on the market. Take a look at the top treadmills on our website today.